Wednesday February 19th 1890 I felt considerably better today and helped do the morning work. It was pleasant in the afternoon and Will helped me wash we put the clothes in the garrett. Thursday February 20th 1890 It was much colder this morning. I helped about the work. Hattie was over all the afternoon. I did not feel as well as I did yesterday. went to bed early. It is 45 years today since Father & Mother were married. Friday February 21st 1890 We got the ironing done before noon and Mother went to town in the afternoon. I knit some and put the clothes away. I feel better that I did yesterday We got a letter from Mary Woolf and they will start for here the 4th of March. Will helped George haul ice. Saturday February 22nd 1890 It snowed some today and we were close at home all day. Will worked for George in the forenoon and was to town in the afternoon. We dressed a turkey for tomorrow and sent a chicken over to Hatt. I did some mending and read a little. 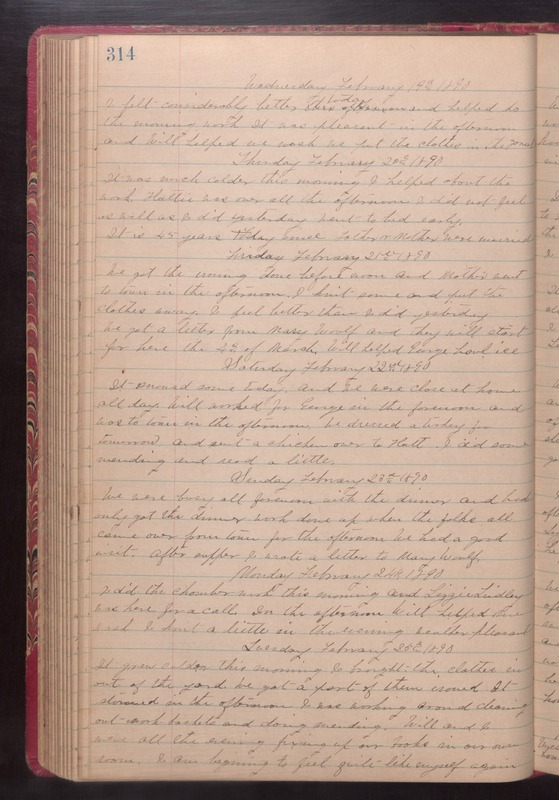 Sunday February 23d 1890 We were busy all forenoon with the dinner and had only got the dinner work done up when the folks all came over from town for the afternoon. We had a good visit. After supper I wrote a letter to Mary Woolf. Monday February 24th 1890 I did the chamber work this morning and Lizzie Lindley was here for a call. In the afternoon Will helped me wash. I knit a letter in the evening. weather pleasant. Tuesday February 25th 1890 It grew colder this morning. I brought the clothes in out of the yard. We got a part of the them ironed. It stormed in the afternoon. I was working around cleaning out work baskets and doing mending. Will and I were all the evening fixing up our books in our own room. I am beginning to feel quite like myself again.